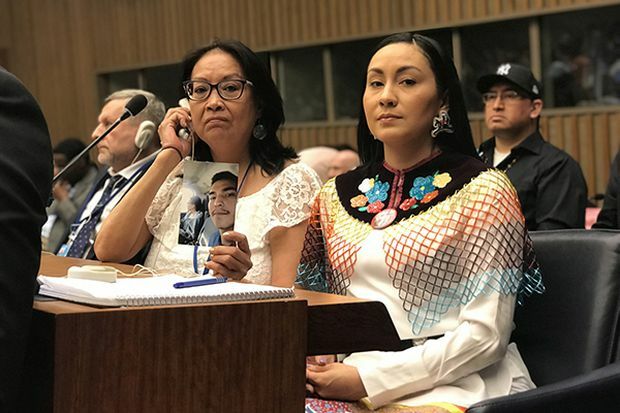 Tasha Hubbard’s 98-minute nîpawistamâsowin: We Will Stand Up documents Colten Boushie's grieving family’s pursuit of justice. If the twin forces of box-office receipts and critical acclaim add up to anything, we are currently living in the golden age of the documentary. Last year, four documentary films (RBG, Won’t You Be My Neighbor, Three Identical Strangers and the Oscar-winning Free Solo) surpassed the US$10-million mark at the North American box office, marking an unprecedented hot streak. And 2019 is already shaping up to be a year whose cultural landscape is, at least partially, defined by docs – witness the seismic conversations being stirred by HBO’s Leaving Neverland and Netflix and Hulu’s duelling Fyre Festival exposés. Into this reality-crazed landscape enters Toronto’s Hot Docs, which on Tuesday morning revealed the full slate for the 26th edition of its film festival. Given the organization’s lauded history – this is the fest that made household, or at least in-the-know-household names out of Nick Broomfield, Barbara Kopple, D.A. Pennebaker and Chris Hegedus – there is little surprise that the 2019 edition will feature big names and bigger ideas. There will be Ai Weiwei’s The Rest, an on-the-ground look at Europe’s refugee crisis; Martha Kehoe and Joan Tosoni’s If You Could Read My Mind, the first feature-length documentary about Gordon Lightfoot; Don Argott and Sheena M. Joyce’s Framing John DeLorean, a hybrid docu-narrative featuring Alec Baldwin as the would-be automobile titan; and Killing Patient Zero, Laurie Lynd’s demystification of the Quebecois flight attendant once branded the epicentre of the 1980s AIDS epidemic. Ai Weiwei's The Rest follows the daily lives of refugees in Europe as they hang in limbo between the humanitarian aid system and intensifying nationalism. Yet, the real story of Hot Docs 2019 is not what is being screened but who is responsible for these doc-obsessed times. Last year, Hot Docs celebrated 25 years by reaching, for the first time in its history, exact gender parity in its programming. This year’s lineup does that milestone one better, with 54 per cent of the 2019 slate arriving courtesy of female filmmakers. The festival’s embrace of diversity will start right from the top, too, thanks to the opening night selection of Tasha Hubbard’s doc about the Colten Boushie case nipawistamasowin: We Will Stand Up, which also marks the first film by an Indigenous director to kick off the festival. Diversity and representation has long been a priority for Hot Docs – 2017′s festival hit 48 per cent gender parity – and its impact can already be felt across the documentary community. According to the American advocacy group Women in Hollywood, the largest percentage of female directors, relative to men, worked on documentary films in 2018 (33 per cent, compared to 11 per cent for horror movies). The reasons are depressingly obvious: there are fewer male gatekeepers in the doc industry, the financial barrier to entry is lower, the stakeholders are fewer in number. So while Hot Docs’ efforts are noticed, there is still far more work to be done and more difficult conversations to be had. Don Argott and Sheena M. Joyce's Framing John DeLorean investigates the story of the enigmatic automaker. Hot Docs’ representation-forward priorities are visible throughout this year’s selections and perhaps no more so than in the new Persister program, which exclusively features female-directed films about women “speaking up and being heard.” Titles include the world premiere of Maxima, focusing on a battle between Indigenous Peruvian women and a mining giant; Haydee and the Flying Fish, which details the court battle of a Chilean woman who was tortured under the Pinochet regime; and A Woman’s Work: The NFL’s Cheerleader Problem, an investigation into the league’s labour violations. As with any genre’s golden era, though, it may be a challenge to ensure nothing gets left behind or overshadowed. While last year’s Hot Docs featured a record-high 246 films (including full-length, medium-length and shorts), this year’s slight claw-back to 234 films (plus 18 “interdisciplinary projects”) still represents a seemingly insurmountable amount of content to consume, even once the festival dust clears.